The Microsoft Courier will never make it out of Microsoft’s labs and into consumers hands. The project is dead. Kaput. Finished. At least that’s what two sources told Gizmodo. Apparently the Courier team got an email from Microsoft execs that stated the project will “no longer be supported,” which pretty much means the project is dead. Even though it’s somewhat surprising that the project was axed seeing as it was reportedly close to completion, it’s not unheard of in other industries for companies to spend untold fortunes on a concept just for the hell of it. The auto industry has been doing it for years. Some of the concept cars that are rolled into auto shows are fully-functional models, complete with advance drivetrains and electronics. But yet they never hit the streets in a mass-market form. 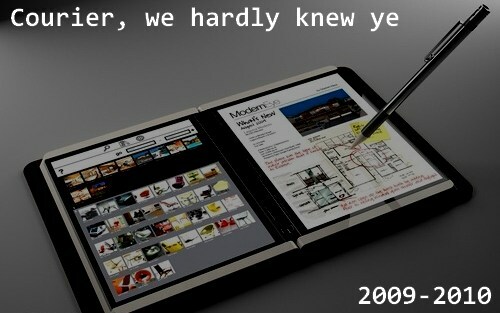 Perhaps the Courier was always designed as such, a technology research project and/or marketing ploy. It always seemed like a “don’t forget about ol’ Microsoft” item anyway.